Can't talk now......got a frog in my throat! One major highlight of this last trip was finding a Green Night Adder on the road that had just given a venomous bite to this frog and about to swallow him, a rare treat to see. If it wasn't on the road, we'd have no chance of ever seeing this camouflaged predator. This little guy was so pissed off that we had disturbed him he even lashed out by trying to twice bite our car tyre! Lying completely flat on the ground gave me this eye level view. A great opportunity, well executed! Great opportunity well captured with a great perspective. A fine ground level view of this feeding behaviour. You were brave to by lying on the ground with this angry Adder! Well done-an amazing capture of the event. 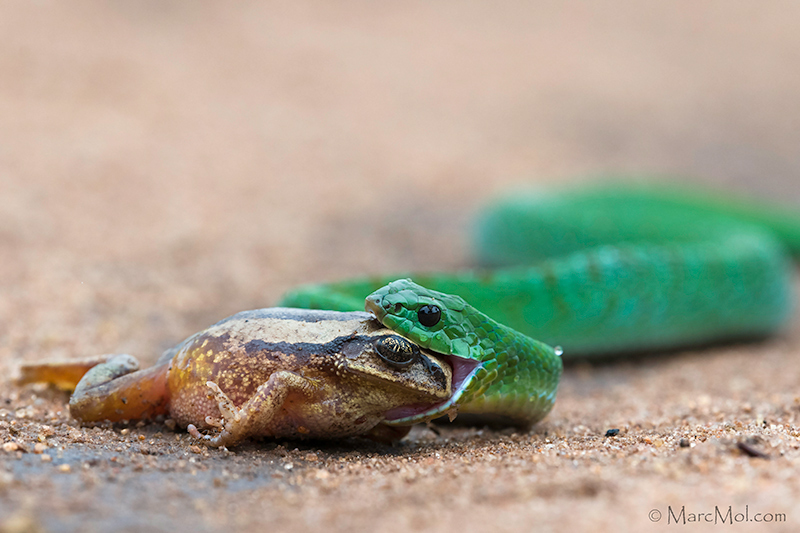 How did the snake lash out at your car tire with a mouth full of frog?? and we posed no threat.